If your game is simple enough, or has a small enough set of cards that you're careful with, it doesn't need such a rule (for example Temporum doesn't have it); past a certain point you need it. You might actually lose track of a card; what then? At first glance it seems like "do two things with a card" is the culprit, e.g. Thrones. But if you have enough triggered abilities, you can build the problem cases. These days I think I would go the other way on Throne / Feast; if you can't put a card into play and it isn't there, you don't follow the instructions. That seems like it would work, and well, to follow the instructions we have to know what they are, and this means they're always there when you have to follow them. So it just seems better. And then it deals with some problem situations, saves some words in places. Note again that Thrones look special but are just the easiest way to get the problems they create. Playing a card a single time can also generate problems. Probably I wouldn't give up on having one-shots and durations; however I could have had types for one-shots and Thrones, so that cards could refer to them (and thus could exempt them) and that could have helped in places too, getting rid of e.g. Procession problems. I don't think it's reasonable to argue that we can probably just fish cards from the discard pile so why not allow it. Ditto for cards on top of decks. I think, once the card is out of sight, you have to stop messing with it, or you'll have problems. I think you could cut way down on how much that matters though, by changing the "play a card" rules and then tweaking a few specific cards, e.g. the tweak for Summon I posted earlier. Ideally you simply work on your game for 10 years without getting it published; then you can take everything into account and get it all perfect. And I recommend this approach to anyone who otherwise would be my competition. I think the wording thing also really depends on the game. One is the number of interactions. 7 Wonders for example has a wonder from an expansion that does the same thing as one of the base game (grabbing cards from the shared discard pile), and the rulebook hard-codes that the base game's wonder goes first if both try to do that the same turn. It's not terribly elegant to hardcode things like this, but if your game doesn't have that many interactions, you can still do it. Dominion has countless interactions, so printing hard codings in the rulebook would be impossible. A second thing is how easily rules can be guessed from a "what makes sense" perspective. Tunnel is a case where nobody really has a problem with it, because, uh, it doesn't really make sense that you'd be able to gain the entire Silver pile. For games that are more thematic than Dominion, this can't only be applied in that sense, too, it also can help memorize edge cases that would otherwise be hard to remember. This ties in with the hard-coded thing: For example, in the game lifeboat, when you have a bucket of chum in the boat and fall overboard, the bucket will do the same thing as played - attract sharks. Other things don't do this, but it makes sense the bucket would do that thematically, so it's not as hard to remember. The last thing is lightness, of course. In a cooperative game or a game where the winner doesn't matter (party games), you can just vote to resolve a lack of clarity. In a strategic game where people actually try to win against other players, this can't really work. Now I'm idly wondering how much a "gain every Silver in the supply" Event would need to cost. My reckoning is "only" about $12? It's essentially unpriceable; in the games where you want it, it just wins, whereas in the games where you don't, you're probably not really interested. 0: I have a Watchtower in hand. 1: I buy a Border Village (any on-buy effects are resolved, there are none). 2: I gain the bought Border Village (the way I understand it, bought cards are first bought, then gained. The gaining puts them in your discard, not the buying. On-buy effects are resolved BEFORE they are in your discard unless otherwise specified). The Border Village is placed on top of my discard pile (there are no on-gain effects that say 'instead'). 3: Any on-gain effects are now triggered. There are two: the optional revealing the Watchtower, and the mandatory 'gain a cheaper card' on Border Village. Since they happen at the same time, I get to decide which one happens first. 4: I first do the Border Village effect. I gain a new card which covers up the Border Village in my discard, and since I only know the top card of my discard, I cannot top-deck Border Village with Watchtower. I can still reveal Watchtower to top-deck or trash the newly gained card, revealing the Border Village below it, but I don't know if this was the same Border Village as before. Furthermore, since I resolved the Border Village `gain' first, revealing the Watchtower can only refer to the most recent gain, and not one before it. 4: I first do the Watchtower effect. Since Border Village hasn't dissapeared to below the top card of my discard pile, or has been shuffled through my deck, I know with certainty that the top card on my deck is the gained Border Village. I reveal my Watchtower and top-deck it or trash it. 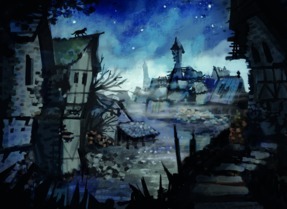 5: I now resolve the Border Village effect. Since Border Village was gained, the effect is triggered regardless of where it goes, so it being moved to the top of my deck or the trash doesn't remove its on-gain effect. So I now gain a new card and put it on my discard. 6: I can now use Watchtower to trash/top-deck the newly gained card as well. So as far as I understand it, the problem with Summon is that it says "Gain. Set aside." Which is ordered, and not concurrent/parallel, so the actual gaining can mess up finding it when you need to set it aside, because other 'when you gain'-effects come before the 'Set aside'. That was my "third type", where I could only think of a card actually being shuffled in, which you could have a specific rule for. But I guess you're implying that there are other cases, which doesn't seem unlikely. These days I think I would go the other way on Throne / Feast; if you can't put a card into play and it isn't there, you don't follow the instructions. That seems like it would work, and well, to follow the instructions we have to know what they are, and this means they're always there when you have to follow them. So it just seems better. Right, that's a much better general rule than changing the text on Throne Rooms like I suggested, and it would have the same effect. Note again that Thrones look special but are just the easiest way to get the problems they create. Playing a card a single time can also generate problems. Yes, that was my "fourth type", a big category. My idea was to allow "losing track" then, assuming that the players know where the card is. Actually, the Princed Hound example was wrong (it doesn't happen), but a Princed Alchemist would be put on your deck and also played by Prince next turn (normally from your hand); and this is actually not so great because the Alchemist could be put on your deck or discarded in the meantime. At the very least the tracking would be horrible. Clearly my rules are not enough. But I'm still not sure that I agree with you that simply having a card covered up means you should lose track. Given that the current lose-track is in place for all physical movement of cards, I don't see the problem (at least right now). And it would make some counter-intuitive interactions more intuitive and simpler. You could Summon Death Cart, or Watchtower-trash/topdeck whichever card you wanted with Cache, Border Village, etc. Everything you wrote is correct except this. The conclusion is correct, but there's a mistake in the reasoning. You can still reveal Watchtower for the BV gain, since that window is still open - you're still doing when-gain stuff for the BV gain. You can choose to move the BV, but it will fail. The only reason Watchtower can't move the BV, is that it lost track of it since it was covered up. This distinction actually matters when you gain Rocks and have a Watchtower. ---Border Village when-gain effect (other card gain).